I find it very interesting and highly exciting as I participated in the Asian Food Fest every month. Their theme for this month is Indochina. Once again I surfed the internet and read up books to widen my horizon and to learn more about the cuisines and food cultures of Indochina. As I surfed, Vietnamese food caught my attention and so I am going to try out Vietnamese food for this month. It is a delight and it gives me great satisfaction each time I am able to cook the food successfully as guided by the recipes. Sometimes I have to make adjustment to suit my individual preference and sometimes it is because of unavailability of the specified ingredients. It brings me joy that I have unwittingly started on a fantastic journey into the culinary realm of foreign cultures. I shall continue my exploration to gain further insights and knowledge as I find it very rewarding. It enriches my culinary experience as I absorb and feed my basic senses to enjoy the good food and good taste of other cuisines. 1. 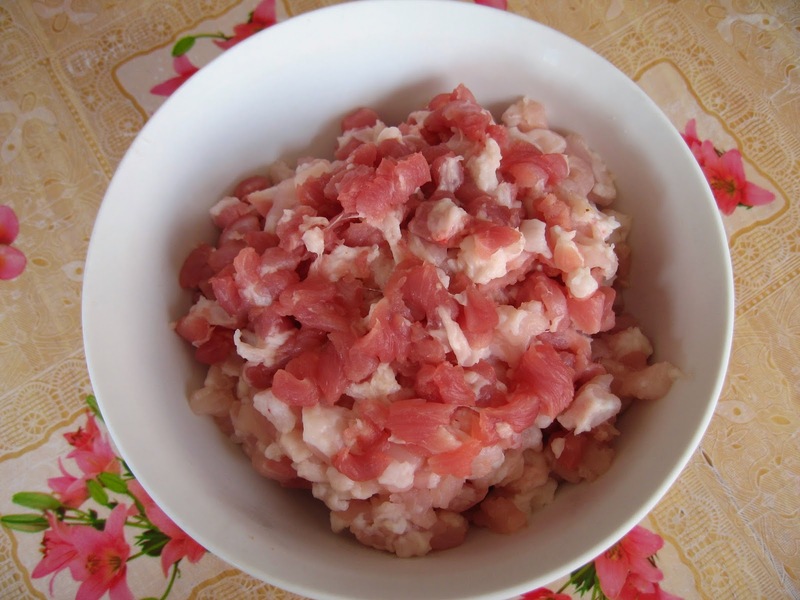 Mix all the ingredients together and allow to stand for 3 to 4 hours. 2. Add in salt just before steaming. Stir to mix well. 3. Spoon batter into small bowls and steam over high heat for about 5 minutes until cooked. 4. Use a thin knife to slide around the edges of the bowl and invert them onto a serving dish. 1. 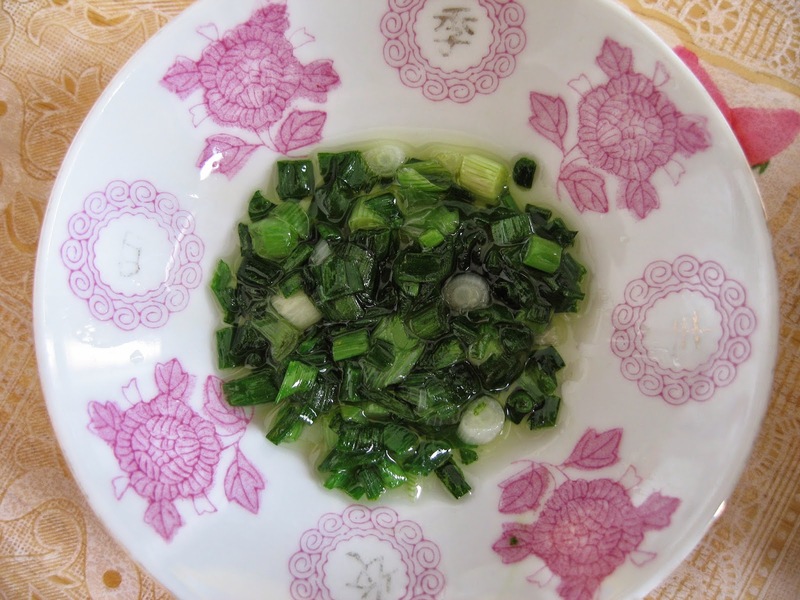 Place one tsp of oil into hot wok to stir-fry the chopped spring onion for few seconds. Dish up immediately. 2. 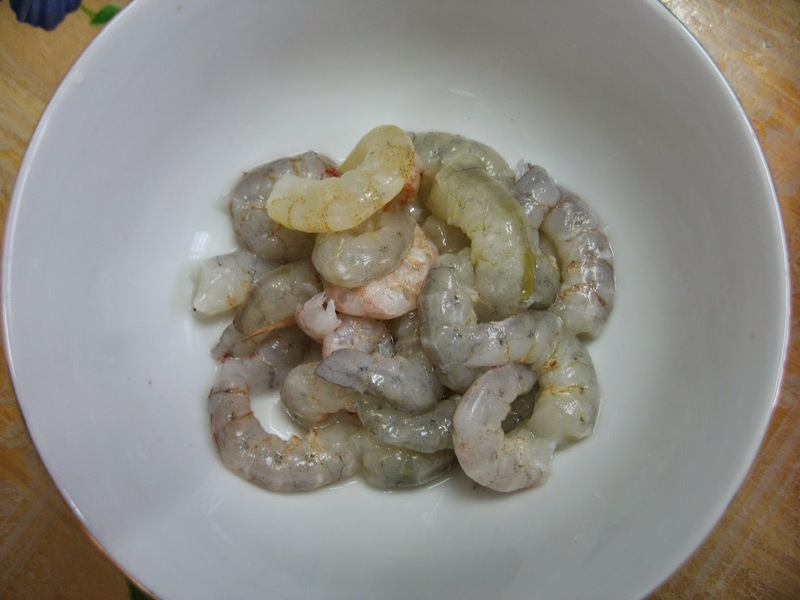 Add 1 tbsp oil to wok and stir-fry the minced meat and chopped shrimps. 3. Season with fish sauce and pepper. Fry until cooked. Dish up and set aside. 1. 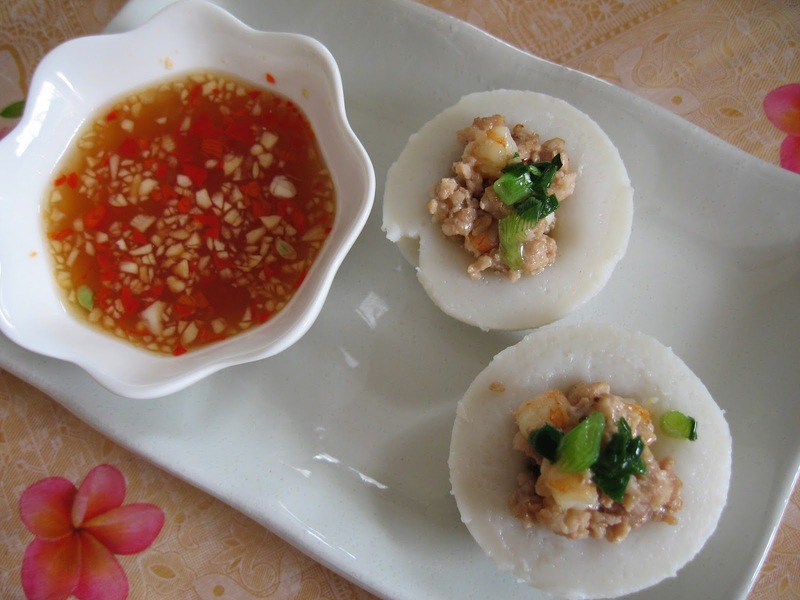 Place a piece of rice cake on a plate. 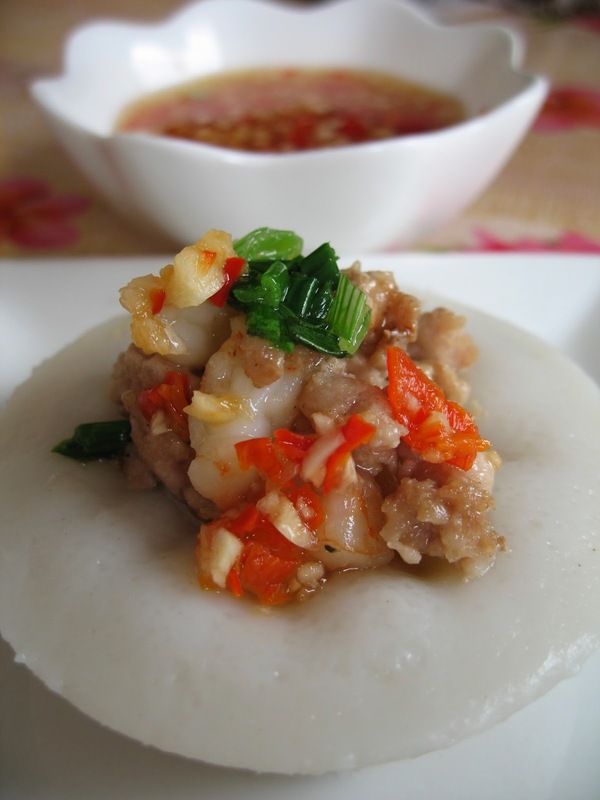 Top with filling of minced pork and shrimps. Add some stir-fried spring onion. 2. 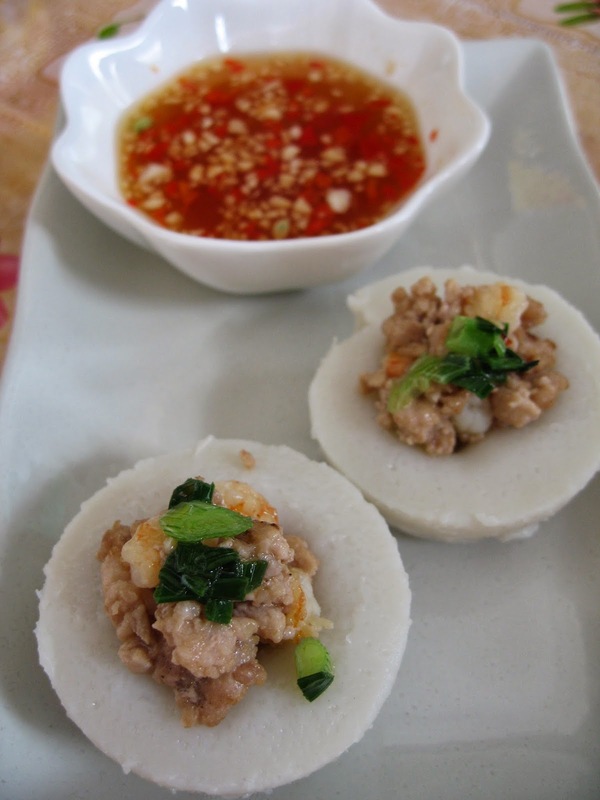 Spoon some Vietnamese dipping sauce over the rice cake. Good morning, Doris! This is perfect for lunch! I definitely have bookmarked it to try. Might be good for my breakfast! Looks like the Teochew Chwee Kueh, I'm sure it's delicious! Thank you for your submission!